Free. Sign up as limited spots. Contact details: Email - sara@motifpoetry.co.nz to sign up. Join Sara Hirsch (UK Slam Champion and internationally acclaimed spoken word educator) plus a special guest facilitator for a morning of fun, interactive and informative workshops as part of the Wellington Festival of Slam. 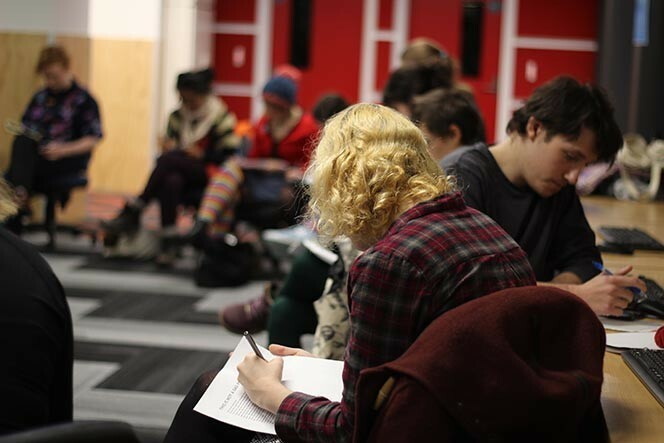 Covering everything from writing to performance, these back to back workshops will get even the most rusty of writers scribbling & shouting poetry. Perhaps you have a few new poems and need a safe space to try them out? Maybe you want to give performance poetry a try but don’t know where to start? Or possibly you are competing in the regional slam final that evening and need some last minute practice? Whatever your experience, background and ability, we would love to meet you at these informal sessions. The Wellington Festival of Slam is produced by Motif Poetry and funded by Wellington City Council and Creative New Zealand and we are proud to offer these workshops for free to anyone aged 14 and over. The first workshops will run from 10-11am and then the participants will swap over and join the other expert facilitator for the second session from 11.15am-12.15pm. So there is no chance of missing out! To sign up please email sara@motifpoetry.co.nz as places are limited. Motif Poetry is a new spoken word production company set up by internationally renowned poets and performers Ben Fagan and Sara Hirsch. Between Sara and Ben Motif boasts TEDx speakers, national slam champions, Masters level educators and published poets. Motif is committed to growing communities of writers in Aotearoa New Zealand.